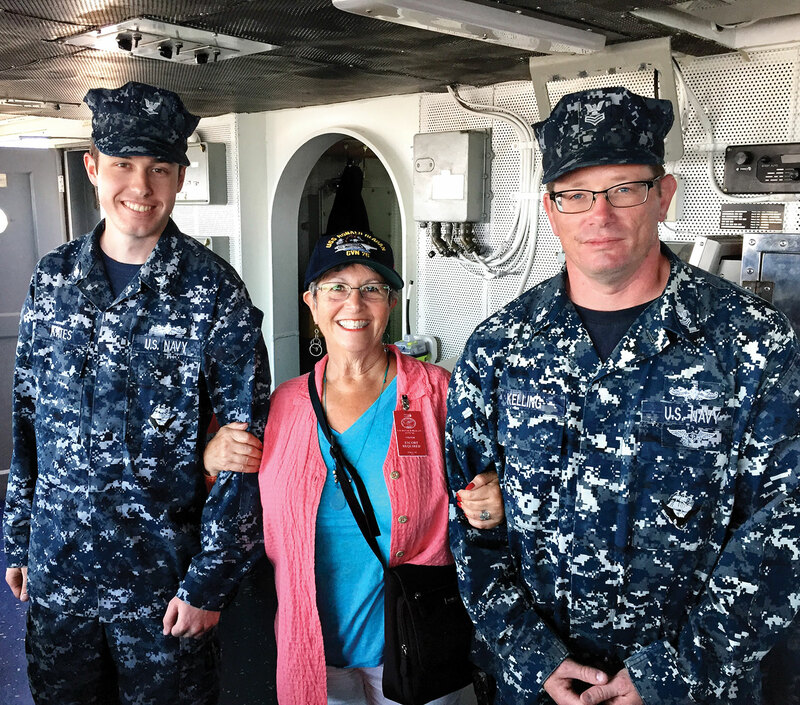 On Sunday, June 21, Don and I were treated, along with my sister, Sandy Bollinger and her family, to a 2-1/2 hour tour of the aircraft carrier USS Ronald Reagan (CVN 76) at Coronado Naval Base in San Diego, CA. Sandy’s niece, Lt. Commander Lara Bollinger, head of the Department of Public Affairs on this the world’s largest and most technologically advanced aircraft carrier wanted us all to have the opportunity to see it before it changes duty stations this summer. The Nimitz-class nuclear-powered supercarrier is also the 76th naval aircraft carrier, making its designation CVN 76, (CVN stands for aircraft carrier, fixed wing, nuclear powered), thus the large number 76 on its exterior and the name of its magazine, The 76er. The magazine is put out by Lara’s Public Affairs Department. Their staff includes writers, photographers and videographers, some of whom worked as photojournalists before joining the Navy. Issues can be read online at http://www.reagan.navy.mil/news.html. The department also runs its own in-house television station. Lara, assisted by Mass Communication Specialist 1st Class Dustin Kelling, and accompanied by Mass Communication Specialist 3rd Class Devin Kates, (whom I took to calling Ohio and California respectively due to their home locales), led us up and down 10 different steep ladders leading from the main deck in the hangar bay up to the navigation bridge and flight deck. It seemed such a confusing maze. We expressed surprise that they don’t get lost, but were told that while it’s easy to lose one’s way when new to a particular ship, there are letters and numbers posted above each entryway to indicate their specific location: whether they are “forward or aft” of midships, “port or starboard” of the centerline, what deck level they are on, and what kind of space they are in. We saw a reception room called the Red Room decorated by Nancy Reagan, which the Commanding Officer uses to welcome VIPs aboard. Elevators take aircraft from the flight deck down to the maintenance area in the hangar bay, and conversely back up when their work is completed. The flight deck itself is 3-1/2 football fields long and looks vast yet still seems impossibly short for the take-off and landing of jets. Catapults accelerate aircraft from zero to about 170 mph in three seconds when launching off the deck. For landing, three wires lay across the aft part of the flight deck, attached to the “arresting gears,” offering pilots three chances for an arrested landing where the tail hook latches onto one of those wires. When preparing to land, the pilots actually accelerate their aircraft so that in the event they miss one of the wires (an event called a bolter), they safely continue on their flight path and circle back around for another try. When their tail hook contacts the arresting wire it effectively stops the aircraft’s momentum, mid-acceleration. When the carrier is at sea the pilots regularly train for both arrested landings as well as bolters so they are prepared for all scenarios. They have the capability of holding 70 planes on the flight deck, can launch aircraft every 30 seconds and can launch and recover aircraft simultaneously. We were awed by the anchor chain that is used to lower the anchor. The chains are the same length as the ship. Each link weighs 350 pounds, and periodically there is a 450 pound piece that goes between the links to help prevent tangling. It is the weight of the chain more than the anchor itself lying as flat as possible along the ocean floor that keeps the ship in place when she is at anchorage. Each time they set sail the anchor is raised again, and the boatswain’s mates take pride in thoroughly cleaning and repainting the visible parts of the anchor chain until it shines glossy black. What a delight it was to see how comfortable Lara is leading her staff. The mutual respect was obvious. We’ve known Lara since she was born, but this was just the second time we’d seen her since she began her naval career. Her positive attitude, accepting and inclusive philosophy of life, and with her intense devotion to the Navy and its mission are quite impressive. Lara says that while she was studying at the War College she was aware of the many challenges that lay ahead during her upcoming tour as an aircraft carrier Public Affairs Officer. She knew the extraordinary leadership challenge aboard Reagan would take her outside her comfort zone as a leader, and as the lead communicator onboard she understood it was her responsibility to think deeply on how to best advise her future leaders and crew on how to manage the collective identity of thousands of sailors that are planned to undergo a unique event. Lara helped plan and will be directly involved in executing an unprecedented three-hull crew swap beginning this summer. This crew swap concept is referred to as the “CVN 220: Three President’s Crew,” and a swap of this scope has never been done before. In August the USS George Washington (CVN 73) is scheduled to arrive in San Diego, and 2,000 sailors each from GW and Reagan will swap hulls. Then while the Reagan forward deploys to Japan, the GW will sail around South America to Norfolk, VA where she is headed for three years of maintenance work. The Three Presidents crew will then fly back to San Diego to take over the USS Theodore Roosevelt (CVN 71) by early 2016. The CVN 220 concept was created by Reagan leadership to give an identity to the crew that will be serving aboard these three carriers in this short period of time. The number 220 refers to the sum of the hull numbers for each aircraft carrier in this swap, and it is worn as a badge of pride that will strengthen the bonds of sailors faced with this incredible challenge. At this time it is unknown where Lara will serve after her aircraft carrier tour is complete. But she has thoroughly enjoyed each assignment and looks forward to whatever new experiences and duties the future holds in store. Don and I couldn’t be happier for her.